Nike invited us up to Los Angeles for two days for a thorough Eric Koston/Los Angeles experience to celebrate the launch of his new shoe. 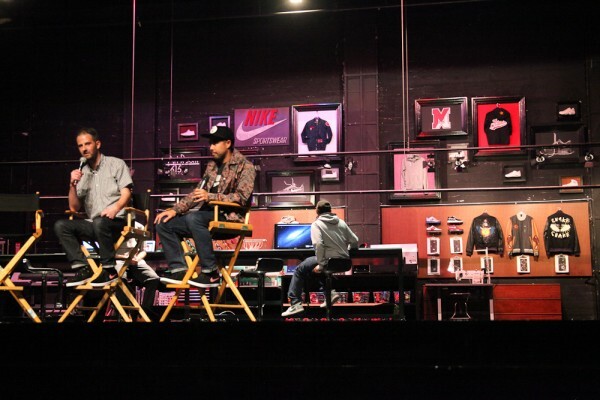 It started off Wednesday afternoon at Nike’s Montalban theater in Hollywood where we had a casual Q&A with Eric and the shoe design Shawn Carboy. We then had time to check out all the golf one-off promo products that Nike made just for the launch—Koston pro model golf balls, shoes, shirts, and putters! We also were able to design our own Destroyer jackets, which if you don’t know, are Nike’s high-end varsity jackets that people make appointments to design and drop several hundred dollars on. So our two-day adventure was off to a good start. Day two was an interactive tour of “Koston’s LA.” We started off with coffee at Intelligentsia—Eric’s fav—then met up with the rest of the crew at Stoner Plaza. Malto and Shane O’Neill were ripping and Nike laced the whole crew with In-N-Out for days. Next we hit the Griffith Park golf course to crush buckets on the driving range with Frost, Biebel, Brad Staba, and Malto. Biebel is the best dude to do any activity with. He hyped up everyone and gave encouraging comments non stop, “Hey Malto, you see that little yellow ball? Why don’t you send that baby on a ride (Raspy Biebel voice)!” And Malto can crush a drive. It was dinner time, so that meant the roof of the Standard in downtown LA for drinks and appetizers. At 7:30 p.m., we hit 6th & Mill for the big party. They had all of Koston’s video parts on display with props next to them: a live goldfish for Goldfish, a live mouse for Mouse, a broken window and Koston’s wallet for Yeah Right!, and so on. Nike transformed 6th & Mill into a miniature golf course with each hole modeled after an iconic skate spot crucial to Koston’s career: Hubba Hideout, the West LA Courthouse, and Lockwood. They were seriously insane. The night wandered on with amazing food from Free Range LA, and Koston’s favorite cocktails being served. Koston made his entrance in a golf cart piloted by Staba while The Blackouts played Make ‘Em Say Ugh by Master P. The night got hazy at this point, so we now direct your attention to the gallery below so it will all make sense. Damn, Nike, #THELEGENDGROWS indeed. Check out our exclusive video interview with Eric.